Real estate markets across Chicago and throughout its neighborhoods are being shaped in dramatic new ways as developers, investors, lenders and municipal officials embrace visions to repurpose and transform underperforming and obsolete properties. Ambitious plans require creative and well thought out financing, development and investing strategies. Join us at our Annual Spring Conference where we’ll further explore the investment perspective of transforming obsolete properties. 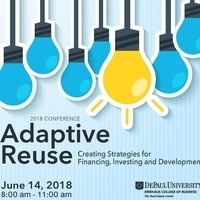 As part of the event, we will delve into the issues and challenges associated with the financing and development of adaptive reuse projects. We will also learn how these market-changing developments can earn extremely favorable returns for investors, and the residual returns they create for local municipalities.